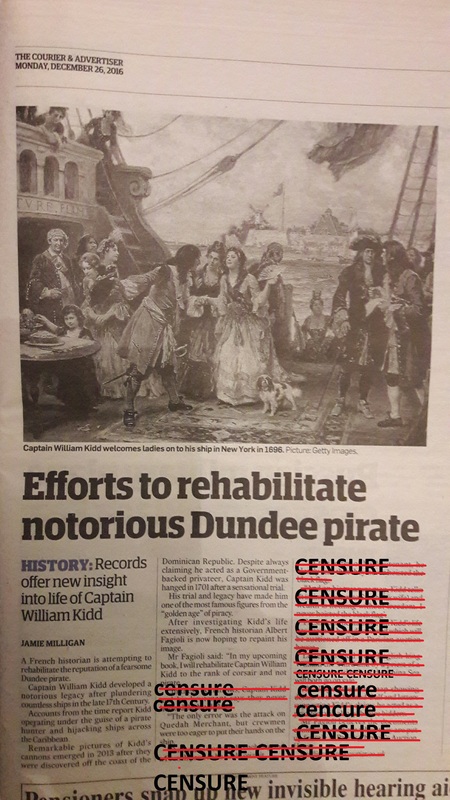 " A French historian is attempting to rehabilitate the reputation of a fearsome Dundee pirate. Captain William Kidd developed a notorious legacy after plundering countless ships in the late 17th century. Accounts from the time report Kidd operating under the guise of a pirate hunter and hijacking ships across the Caribbean. Remarkable pictures of Kidd’s cannons emerged in 2013 after they were discovered off the coast of the Dominican Republic. Despite always claiming he acted as a Government-backed privateer, Captain Kidd was hung in 1701 after a sensational trial. His trial and legacy have made him one of the most famous figures from the “golden age” of piracy. After investigating Kidd’s life extensively, French historian Albert Fagioli is now hoping to repaint his image. Mr Fagioli explained: “In my upcoming book, I will rehabilitate Captain William Kidd to the rank of corsair and not pirate. “Censure Censure Censure Censure Censure Censure Censure Censure Censure Censure. “The only error was the attack on Quedah Merchant, but crewmen were too eager to put their hands on the ship. Censure Censure Censure Censure Censure Censure Censure Censure Censure Censure. la sentence pour l'un (la pendaison) et pour l'autre (le peloton d'exécution) Pour l'un il s'agissait de la pression des Marchands Indiens et l'autre Bonaparte.... ""
" Après 11 mois de publication de cet article, une demande de CENSURE de ces passages, malgré la validation verbale du propriétaire de ces documents à l'époque et il avait été le premier averti de cet article qu'il avait trouvé très bien. Et oui une parole ne vaut rien sans un papier signé. " "Demande de CENSURE le mardi 7 novembre 2017."